Mazda CEO Masa-michi Kogai says it's unlikely Mazda will build another rotary engine, but that's an understandable reaction to market forces. One of Mazda's calling cards used to be its willingness to experiment with unorthodox engine technologies, and none is more firmly etched into the company's history than the rotary. First introduced in 1968 and subsequently a staple of the iconic RX-7, the rotary (or Wankel) engine proved to be well-suited for Mazda's sporty intentions. The pistonless engine is able to rev more smoothly and to a higher rpm than a conventional powertrain, and its lightness gives the car better reflexes and superior weight distribution. Alas, the rotary by design uses more fuel and has higher emissions than other engines with similar power. That spelled trouble for the last of the rotary-powered Mazdas -- the RX-8, which was discontinued last year, was always considered brilliant to drive, but its on-paper performance began to fall behind competitors with steadily more advanced four- and six-cylinder engines. The RX-8's relatively high fuel consumption -- and oil consumption -- made it hard for many buyers of sporty coupes to accept its less ferocious acceleration. Loyalists have continued to hold out hope, though, that Mazda would once again build a car with the Wankel's unique characteristics. 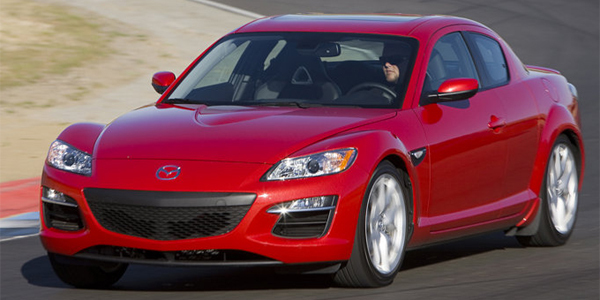 Rumors have swirled about an RX-8 successor and even a rotary-powered MX-5 Miata. But in newly published interview with Automotive News, Mazda CEO Masa-michi Kogai told fans to be realistic. It would take 100,000 annual sales to justify the development of a new rotary, he said -- far above anywhere in the brand's history, or the sales level of most performance cars. Mazda's recent powertrain focus has instead been on "SKYACTIV" -- a comprehensive approach to boosting fuel economy that has yielded outstanding results on the Mazda3, Mazda6 and Mazda CX-5 models. Keeping cars sporty and fun to drive while also making them meet today's demands for high fuel efficiency is exactly what's required in today's automotive marketplace. Gas was cheap in the rotary's heyday, and there was much less focus on greenhouse gas emissions than there is today. The rotary's inherent weaknesses are quite serious in today's marketplace. Does that mean that we should give up hope on ever again seeing a rotary car? Probably not. It's hard to envision the rotary as occupying more than a small niche, but Mazda -- to its great credit -- has consistently pursued sporty niches to the best of its ability. Right now, that ability is somewhat limited. Mazda no longer has access to Ford's deep pockets for its R&D, since the Big Three automaker has dropped its share in Mazda. So the company needs to focus on its mainstream products for now, and its very existence could be in jeopardy if it were failing to do so. The company is gunning to increase its market share from 1.9 to 2.5 percent of the U.S. market by March 2016. But if Mazda's mainstream cars pay off, they could give the automaker the resources it needs to once more dabble in the rotary niche. The way the Porsche Cayenne SUV subsidizes the marque's sports cars, so too can a lot of SKYACTIV hatchbacks and crossovers eventually give Mazda enough money to play around with unorthodox engine technology. Great idea Mazda..kill the engine on which much of your brand's enthusiasm is based. I have spent a lot of sideways time in Mazda RX-8s at Skip Barber schools. LOVE that car. HATE that rotary engine. Glad to see it go. No torque, the worst mileage this side of the F-150, and it "processes" oil. I love the idea of rotary engines, but in practice they have never been the equal of a good in-line 6, which is really where they tried to compete.